​Today, many radicals are asking themselves how they could be waking up to President Trump. Our question instead is what does this mean for the Left in this country. Paralyzing myths have now been shattered, and this situation could, with a lot of work, passion, and clear thinking, lead to a strategy of action and a far greater positive change than voting for the status quo. The change we are talking about is generational and will have a far greater effect than any string of elections, no matter how repugnant they may be. First, this election has dispelled the myth, spread during Occupy, that the primary division in this country exists between the 99% and the 1%. Trump’s victory proves that the conflict is deeper than what amounts to a very simplistic and inaccurate economic calculus: the 99 must surely win against the 1. Many of the so-called 99%ers came out in to support a billionaire, while the other half supported a pro-free trade, Wall Street democrat. Yes, there is absolutely a conflict between the rich and the poor, but that has never been the only division in this country. Those that see the Greatness of America as being misogynist, nativist, anti-urban, and homogeneous in race, sexuality and faith are fighting a rearguard battle against the future which they can not hope to win. This doesn’t mean that they will go away quietly and without inflicting great harm, but that is the nature of dying ideologies. What is distressing is that this desperate rhetoric has captured the imagination of many who have suffered real humiliation and pain under the neo-liberalism of the one-percent. The tragedy is that the rejection and failure of neo-liberalism has led those “left behind” to eagerly cast their lot with the equally oppressive and failed ideology of paleo-conservativism, with its xenophobia, isolationism and anti-intellectualism. This has created a desperate new political alignment that rejects the very things that can restore its adherents’ respect and livelihood. From this vantage point, American electoral politics has been nothing more than a zombie horde of defunct worldviews along with oppressive and dangerous ideologies lurching across the blue and red states. No president can overturn the demographic reality that this country will continue to urbanize, will become more and more diverse, and that the mythologized manufacturing jobs of the past will remain dead and buried. These realities are the true wheel of history – the dead will inexorably give way to the living, the past to the future – and no election can change that. The second shattered myth is that electoral politics is a valid arena for populist leftist change. Whether it is Syriza or Trump, Podemos or Hillary, in the end the Left must confront the oppressive powers of the State and capitalism, none of which can possibly be subverted by superficial electoral games. This is not to say there would be no difference between a Trump administration and a Bernie administration, rather it is to say that the latter would only serve to stall the inevitable confrontation. Electoral politics holds out the promise of slow-moving, incremental socio-political advancement, but real evolution only comes about with a radical change of environment, and this can only be achieved through social revolution. Revolution is not an event that suddenly happens, but something that is carefully prepared, built towards, and eventually implemented by those aligned with the future. All governments, whether they are liberal or conservative, will fight equally hard against threats to the State or the capitalist power structure. So if we are seeking a confrontation that promises a substantial and irreversible change in society, it doesn’t really matter if it is a liberal or a conservative regime in power. Liberal and conservative governments are both inherently reactionary and resistant to any kind of meaningful change, if only because their very existence is dependent on freezing the present and obscuring all possible futures. We have seen this play out recently in places like Spain, Greece, the UK, and countless other countries. It is always the same paradigm: the political structure refuses to truly change and will continue an endless cycle of lurching back and forth between liberal and conservative. This brutal and blind impulse towards self-preservation is not only found in rightist regimes. Both right and left-wing regimes have used the implements of totalitarianism – prisons, secret police, fear, war, and economic oppression – to maintain the status quo. To have a future, we must reject all the State’s apparatuses of oppression, and this includes electoral politics with its self-serving divisiveness and false promises of change and hope. The third myth is that the government has ever been our government. The government is the tool of the State, it is an occupying force now, just as much as it was before. All occupying forces of the twentieth century pair an outward benevolence with a healthy dose of fear and repression. We have always understood this formula, and have been struggling against it. Trump’s victory, nevertheless, heightens the sense of urgency to pull down the mask of benevolence, and we must not squander it. The government has never been our protector, and now those caught up in the trap of “representative democracy” may finally see this as well. Without these myths, what ways are open to us in the dark days to come? The situation has changed and will continue to change during the next four long years. It won’t be easy, in large part because currently the Left is small and lacks the maturity needed to mitigate many of the on-coming attacks on the future. Attacks on women, LGBTQ, POC, immigrants, political dissidents, and so many others, have been par for the course for too long, and the coming years will be no different. Trump’s victory has only increased the number of bullies and people who are fearful. We need to pluck up our courage, ready or not, and do what we can to stand up to the bullies. We need not only audacity, but imagination. Our theater of action must move beyond the co-optable symbolic opposition to the lived reality of everyday struggles against oppression. Our actions need to be bold like the Greek anarchists who squatted a hotel to house refugees or the German Leftists who physically shut down and re-purposed a neo-fascist radio station. We need to take up space in Trump’s America and support others to speak, move, and love in their own neighborhoods without fear. We need to continue to expose the systemic brutality against those racially targeted by the police. While the Trumpists spew their fevered conspiracy theories we will double down on reality. Yes, we will get bashed, we will lose some fights, but there is too much at stake to stay on the sidelines waiting “for next time.” There is no cavalry coming, no courts, no congressional gridlock, no petitions, no media; now it is clear the only recourse is action from the ground up. This is the time when we must ask ourselves: do we really stand with those being bullied even when to do so may cost us our own safety? Is it worth it to stand side by side with the targeted, the scared, and the disheartened, knowing there will be risks? This time we cannot delude ourselves – thanks to Trump these risks are greater but so also are the rewards. We can cower in the corner, or we can stand up and make new comrades with whom we will grow our resistance. We must become ungovernable to the occupation and unwavering in our support of those that feel targeted. This is how resistance is born and how it achieves victory. The liberals promised to protect everyone with nothing but a ballot, and now they have been routed and are publicly conceding on all fronts. They are asking us to passively accept whatever injustices Trump has planned for us, for our neighbors, for our friends, for our co-workers, and for those comrades we have not yet met. We have never believed in hiding who we are or being ashamed of our liberatory aspirations. We know the power of solidarity. We have relied on it for generations and we know it is a stronger, more honest way to protect ourselves and ensure our future. The time has come to stand up for ourselves and what we fight for, to defend the communities that the liberals have abandoned to fend for themselves while cynically asking them to return to the fold in four years’ time. Four years is too long to hide in fear or to look the other way. Let us not be afraid, let us not offer concessions, for we know our work has begun and the future is coming. Let us not be afraid, let us not offer concessions, for we know our work has begun and the future is coming. A Greek court ordered the conditional release of two refugees welcome activists on Friday. As we reported they were arrested in the Greek port of Igoumenitsa at December 28. According to Greek police they were arrested when they allegedly helped 8 refugees to cross the border. 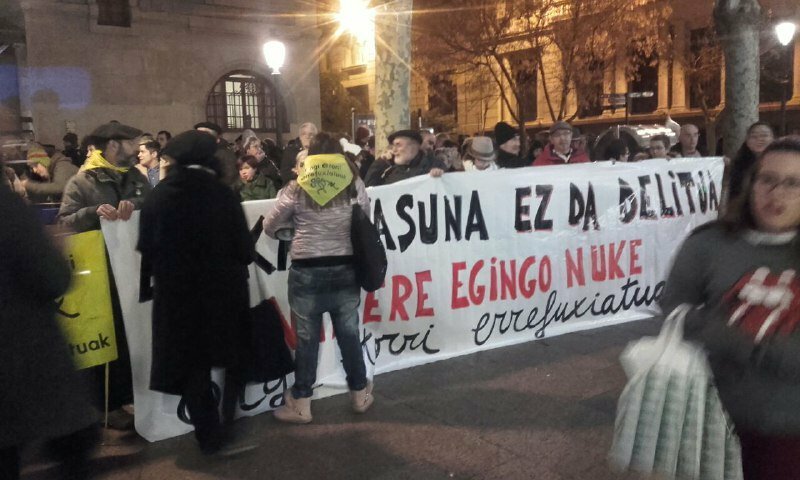 Mikel Zuloaga,61, and Begona Huarte, 59, were released on bail of 2000 Euros each pending a trial whose date not been set. 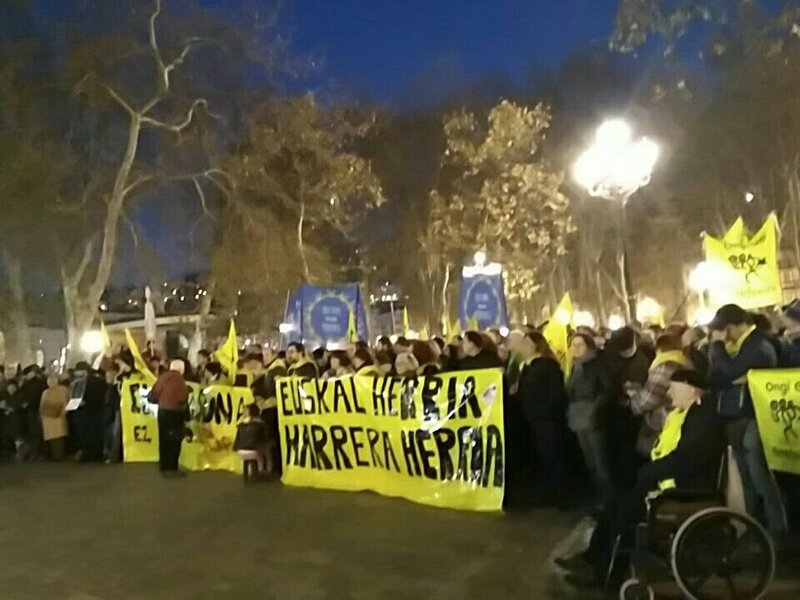 In many Greek and Spanish cities people protested for the release of both activists of the Basque group Ongi Etorri Errefuxiatuak (Refugees Welcome) yesterday. 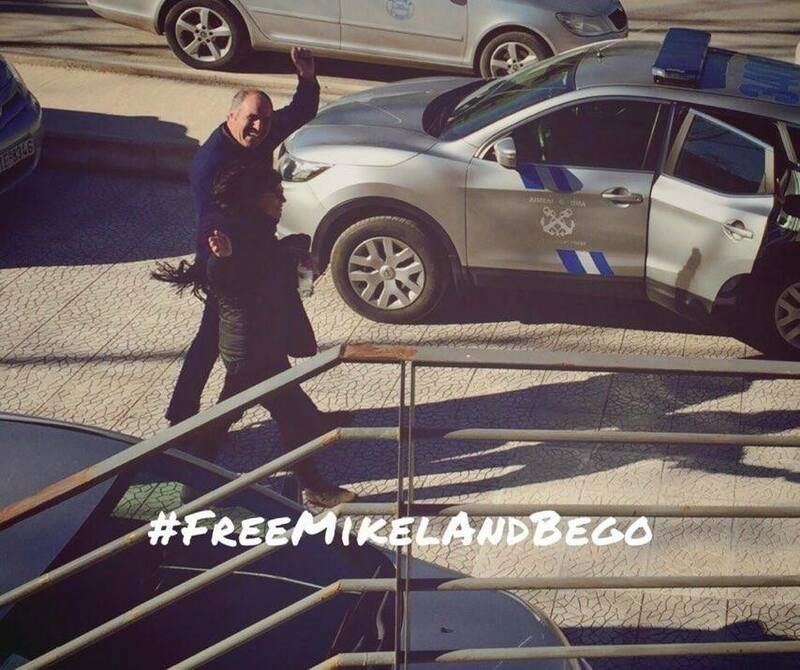 More than 13.000 people signed a petition, demanding the release of Mikel and Bego. According to Greek police Mikel and Bego had been driving a camper van where border police found eight hidden youths from Pakistan, Syria, Iraq, Afghanistan and Iran. Both activists did not take any money of the refugees. In a video Mikel and Bego said they wanted to make a political statement of civil disobedience to the barbaric policies of European governments who have raised borders of death to refugees. So far more than 5000 refugees drowned at EU borders in 2016. Fascists in the US today can agree on little more than the desire for a white ethnostate. Despite conjecture on Trump’s deep interests and desires, few indicators suggest that he would effect such a drastic transformation as that. However, it is the question of process that matters most. There is truth to journalist Arun Gupta’s insistence that Trump’s program would lead to ethnic cleansing, which is why fascists have taken such a shine to him and why the ACLU has declared that they will “see him in court.” Trump has announced his plan to immediately deport as many as three million migrants from the US, and alt-right founder Richard Spencer, who has already associated Trump’s platform with “peaceful ethnic cleansing,” has called Trump’s presidency a “first step” toward a white ethnostate. If one reviews the plans that Trump hopes to implement on his first hundred days in office, the glaring omissions may be the most important. First among these is the rights of women to their bodies — both in terms of reproductive rights and protection from sexual assault and harassment in the workplace, on city streets, and in relationships. What stands out here is the cultural factor — the process through which the behaviors and attitudes of the ruling elite send signals to the public regarding what is acceptable — as well as the political factors tacit within legal rights to abortion and to protection from harassment and assault in the workplace. Reproductive control over women is seen by “race realists” as one of the primary ways of ensuring “racial purity,” but under a Trump/Pence agenda this would take place implicitly. Twitter harassment has been a mainstay of the neo-reaction, including GamerGate and the Sad Puppies movement that accompanied the SciFi Hugo Awards. Other neo-reactionaries, whose sadistic, dystopian elitism is deeply intertwined with white nationalism, include the video blogger RamZPaul, who appears regularly at “race realist” conference American Renaissance. This link with Trump should come as no surprise, given his attachment to Breitbart, which serves as a mainstream haven for white nationalism and neo-reaction. Interestingly, Trump claims to fix environmental infrastructure while insisting on defunding UN climate research and programs wrought from the global Conference of Parties (COP) process that has accumulated more than twenty years of arduous negotiations. This fantastical notion that the environment can be delinked from the climate and “fixed” without regulating industry forms a clever ideological fulcrum to convince people who want to balance the economy with ecology. However, without formulating any visionary economic policies, simply ceding the environment to the corporations takes the US back to the so-called “Reagan revolution,” which fully embraced the reactionary gaggle of ranchers, loggers, and miners who fomented the “Sagebrush rebellion” of the late 70s and early 80s. It is of consequence that the same far right elements have accrued around Trump’s candidacy. The implications are that Trump’s environmental agenda will reset the Republican agenda of “drill baby drill” and return to the early Reagan Administration’s Department of the Interior under James Watts, noted for stating, “If the troubles from environmentalists cannot be solved in the jury box or at the ballot box, perhaps the cartridge box should be used.” In this way, like Reagan, Trump has fused futurist white nationalism with the atavistic illusion of traditional Americanism — ranchers on the old West, patriots, pioneersmen, and frontiersmen guided from the New York penthouse. This kind of vast expansion of the extractive industries would only be possible through a sweeping transferof public lands to private ownership — a demand that has just found its way to the Republican Party platform along with anti-GLBTQI language that GLAAD says makes it “the most hateful Republican Party platform in history.” Aside from giving the green light to the Keystone XL and Dakota Access Pipeline, Trump’s Republican Party that now holds the majority in Congress and the Senate hope to oversee one of the largest land grabs in US history — the effective elimination of the national forest system, wilderness areas, national monuments, wildlife refuges, and national parks. Obama was not an environmental president by any means; in fact, 2015 topped recordsfor oil production in the US. However, Trump will only deepen the movement toward resource extraction and the devastation of what makes this place on Earth great. Much of this direction hews to the Christian Reconstructionist philosophy that Mike Pence brings to the table. An incredibly powerful religious movement, Christian Reconstructionism asserts the divine mission of spreading Christianity over all corners of the world — and not just any Christianity. Theirs is an anti-GLBTQIA agenda that rejects women’s rights in favor of white, patriarchal rule over property and independent from virtually all regulation. Without the support of this movement, Trump’s own dissolute and atrocious behavior toward women and families would have ruled him out of the running. It is this alliance, however, between neo-reaction and Christian Reconstructionism that marks arguably one of the weakest links in Trump’s populist alignment, and renders it a complex, radical right formation as opposed to an outright, hardline fascist movement. This is not to say that Reconstructionism is not friendly to fascists, or downright white nationalist — for instance, Trump’s domestic policy advisor for his transition team is a fellow at the anti-LGBQTIA hate group Family Research Council, whose Reconstructionist president Tony Perkins paid neo-Nazi David Duke $82,000 for a list of supporters to make robocalls on behalf of Woody Jenkins’s failed senatorial bid, and, about a decade later in 2002, provided the keynote speech for a white nationalist Council of Conservative Citizens fundraiser. However, it is difficult to see what kind of macabre chimera this coalition will form between the gay futurist, Peter Thiel, and the anti-gay Reconstructionists. Deepening the populist rhetoric that marks his climate policy, Trump declares that he will immediately deport millions of undocumented migrants from the US, although the number he provides for the first push is a fraction of the 11 million he has presented overall. If he deploys civilian militias to help engage in this work, he is still not too far from Bush, Jr., or even Obama, who deported more immigrants than any other president in US history. Neither of those two worked to suppress the powerful border militias in the late 2000s, some of which were rather openly fascist in ideological disposition. However, what stands out in the numbers is that, while Obama deported more than 2.5 million migrants between 2009 and 2016, Trump states that he will deport as many “immediately.” His campaign used the number 11 million, which comes right out of the white nationalist movement. From there, he plans to reform “visa rules to enhance penalties for overstaying and to ensure open jobs are offered to American workers first.” The opening part about enhanced penalties would obviously mean a life preserver for the prison industry, which faces challenges from abolitionists, the decriminalization of marijuana, the recognition of its social failures, and an institutional rejection of private prisons. Undocumented people caught re-entering the US will face a stiff prison term, entering a spiral of criminality that broadens as attempts build up. Furthermore, Muslims will be subjected to “extreme vetting,” a chilling phrase for all its lack of specificity. The “Americans First” line and its references to a pro-Nazi anti-interventionist group in the inter-war period should not be overlooked. To help implement his plan for controlling migration, Trump has brought the architect of SB 1070, Kris Kolbach, onto his transition team. A veteran of anti-immigration network set up by white nationalist John Tanton, Kolbach helped create SB 1070 with the help of the American Legislate Exchange Council (ALEC). SB 1070 was then sponsored by the President of the Arizona State Senate, Russell Pearce, who once sent his supporters an article by the neo-Nazi group National Vanguard and endorsed neo-Nazi border militia leader JT Ready for public office. By declaring that Mexico will pay for an incredibly expensive, large wall across the US-Mexico border, Trump provokes anger that he can use later as an excuse to deploy military or police operations across the border — perhaps something like an invasion. Although it would appear that an invasion would not be likely, this again would not be completely unprecedented, given the history of “Rough Riders” and the Roosevelt corollary to the Monroe Doctrine establishing intervention in Central and South America in the event of debt default, as well as more recent Drug War-related interventions into the politics of Central America — particularly, the invasion of Panamaunder Bush, Sr. Given Trump’s trade agenda, such an open form of imperialism would act as a kind of foreign policy replacement for neoliberalism. His promise to reign in corporations by drawing factories back into the US and to lower the business tax for everyday Americans speak to the values of “the little people,” the middle class or petite-bourgeoisie. Trump’s further scapegoating of China as a “currency manipulator” will exacerbate the ongoing tensions in the South China Sea, and likely increase the militarization of Japan, while also increasing racist persecution of Asians in the US. The aggression toward China is accompanied by the favoring of Putin, an alliance that would marginalize other global powers — not least of which being the European Union and perhaps even NATO — and challenge the US’s pretensions to unilateral global superiority. Instead, Trump would play into deeply-rooted fantasies of what Russian fascist Alexandr Dugin calls “a multipolar world” of apartheid-style ethnostates from Portugal to Berlin to Moscow and down to the Indian Ocean. It also exploits long-standing racist attitudes toward Asians in general in the United States, which are shared across the Atlantic in Europe by populist radical right Eurosceptic parties linked by Moscow’s supportand a Duginist network that will surely feel a boost as the Trump wave’s demonstration effect washes ashore. Trump has already begun reaching out to radical right populist parties in Europe — even before reaching out to their respective heads of state. The Islamophobic sentiment that Trump rode into power could easily give itself to a rising wave of anti-Semitism, as represented by the alt-right — particularly if the populist radical right sweeps away the left and center in the next round of elections. That Trump has indicated that he will continue the mass rallieswhile in office suggests the ominous potential for collective, mass violence and an ongoing personality cult. What carries over most of all in Trump’s populism is his determination to “drain the swamp” of Washington, DC. Imposing term limits on Congress and diminishing the federal payroll through attrition speak to longstanding populist complaints with federal corruption and over-spending. We can likely rule term limits out, since the Senate and House will both be controlled by politicians who enjoy term limits very much. However, the “draining of the swamp” can be tied to slashing progressive budget initiatives supported by Democrats, while the attrition of the federal workforce gives people with the ability to fire their subordinates the ability to create a controlled, tradition atmosphere that rapidly shunters into obsolescence. As the data shows, the cross-class mobilization of interests that Trump galvanized was not particularly impressive, falling behind Romney and McCain in votes gained. Just over a quarter of eligible US citizens voted for Trump. However, the radical rejection of the “DC establishment” pulled the Democrats under water, as Hillary’s constituency bailed on her at the ballot box. The press’s rejection of Bernie Sanders in favor of Clinton during the primaries rendered her most valuable media partners moot in those northern states still fuming over the suppression of their favorite blue-collar candidate. “We just saw massive shifts in the industrial midwest from ’12 to ’16, and those are the same voters,” said David Wasserman of the Cook Political Report. Now that Democrats like Elizabeth Warren and AFL-CIO are singing the tune of reconciliation, the press seems subdued as Trump ushers futurist white nationalists and regressive Christian Reconstructionists into the White House. The question of fascism that has lingered for so long amid this election becomes more important in the long run. More than one-third of Trump’s supporters follow open white nationalists on Twitter, who are among the most outspoken advocates of Trump’s policies; meanwhile, his past relations with Roy Cohn, Roger Stone, and other grey eminences point to a creeping fascism under the populist generalism. His team would involve other white nationalists like Kobach, assuring that the deportations would lead closer to a white ethnostate, the rejection of a woman’s right to make decisions that immediately effect her own body and physical wellbeing would fall under patriarchal control, and this is to say nothing of what he will do to labor organizing — just remember what the AFL-CIO was saying a few months ago. 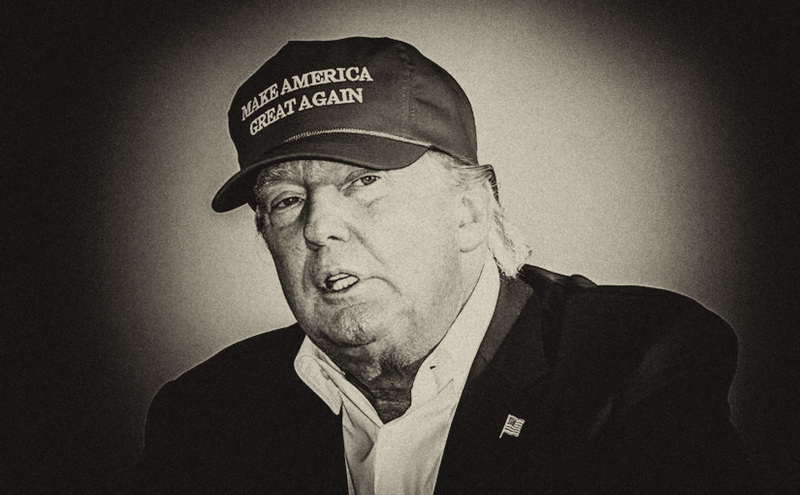 In August 25, 2015, I wrote an article called “Trump the Fascist,” in which I stated that Trump’s trajectory “lands quite clearly in the tradition of ultra-nationalism known as ‘Americanism.’” With his palingenetic overtures to the rebirth of an old, dying America, Trump has certainly activated the mythical core of the fascist imaginary, which is being enacted throughout the US in the form of a spate of recent hate crimes that may carry on through the weekend. Although Trump’s agenda is a mixed bag between what one can precisely describe as fascist or white nationalist and the populist radical right, it is this trajectory that truly matters, which is why his policies and the white nationalism that he encourages must be directly confronted and opposed. People of conscience with any faith in liberty and justice must openly resist the decline into racist hatred and violence, effectively halting the momentum of the Trump wave by making our cities and towns safe for all people. Alexander Reid Ross is a lecturer at Portland State University. His latest book, Against the Fascist Creep (AK Press), is forthcoming. 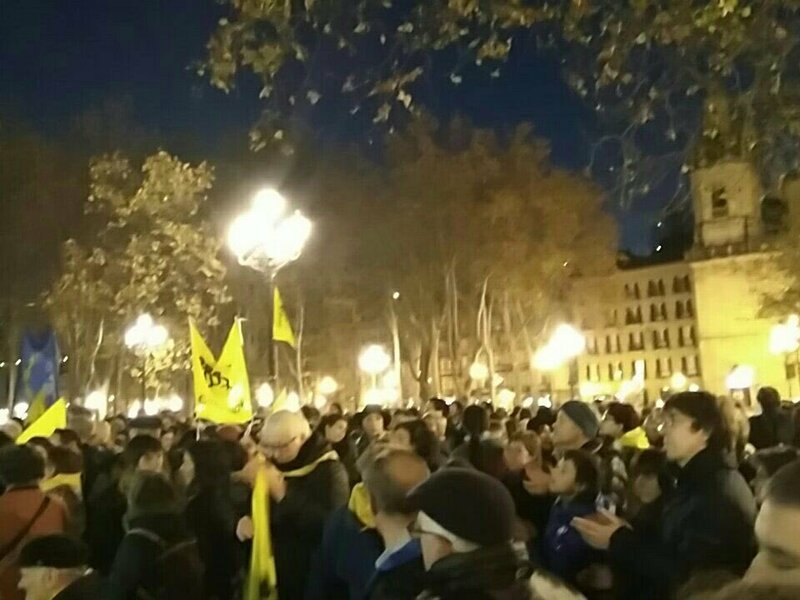 ​On Tuesday , December 6 of 2016 , 8 years after the murder of the anti-authoritarian Alexandros Grigoropoulos by the cops; anarchists, anti-authoritarians, neighbors and people who hang around Exarcheia decided to break the normality of the miserable life imposed by the social standards and resist the state repression. Every year, that day the neighborhood of Exarcheia is surrounded by cops trying to stop the vengeful rage of those who take the streets fighting. But this time, the resistance of the rioters was more organized and coordinated than ever, following the response against the state in the clashes of November 15 and 17. The anti-state offensive was fierce, and that was proved because – despite the murderous firing of rubber bullets and tear gas directly into the bodies – The uniformed fascists only managed to pass the burning barricades late at night, and after most of the people, especially the organized ones had already left the place. Also the filthy judges plays their part on the repression of the insurgents when acting in the name of all the state authorities send three of the arrested to pre-trial imprisonement. We answer the murderers of kids with the same thing that they learn to taste all this year: fire. In the evening of Friday , December 16, we chose to attack the bullies of the Greek police located at the intersection of Kallidromiou street and Oikonomou street, supposedly to protect the supermarket. For those who knows the area of Exarcheia, is obvious that the deployment of OPKE units in that place serves other purposes and is framed in a broader plan that seeks to control the neigborhood. The tasks of this unit (OPKE) in the past years at the city outskirts and especially in the west zone of Athens had as its only objective the military-style ID control of youngsters, outcasts and migrants. The ridiculous reasons that they use to impose their reign of terror in Exarcheia will be answered with gasoline and fire over their heads. The armed cops of OPKE showed their huge skills when they began to run away in panic and hide behind a car in sight of the 15 molotovs flying against them. 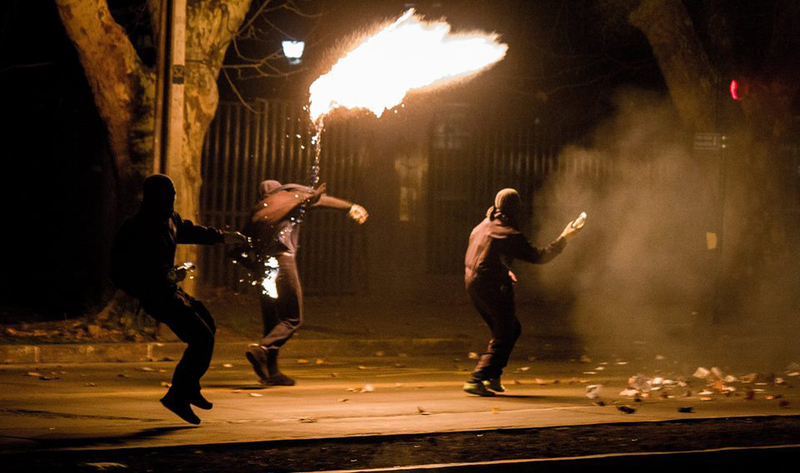 The clashes and the diffusion of insurrectionary situations must be a daily practice. Let December 6 light up the metropolis every night, until freedom and anarchy. FREEDOM TO THE 3 ARRESTED OF 6/12 WHO ARE ON PRE-TRIAL IMPRISONMENT. ​Under the title, “The Two Main Trends in Anarchism,” a selection of my writings has been published in Greek. ΟΙ ΔΥΟ ΚΥΡΙΕΣ ΤΑΣΕΙΣ ΤΟΥ ΑΝΑΡΧΙΣΜΟΥ. The writings are taken from Anarkismo, except for the following, which was written originally for the new book. It focuses on the centrality of a vision of freedom, cooperation, and happiness in the program of anarchist-socialism. 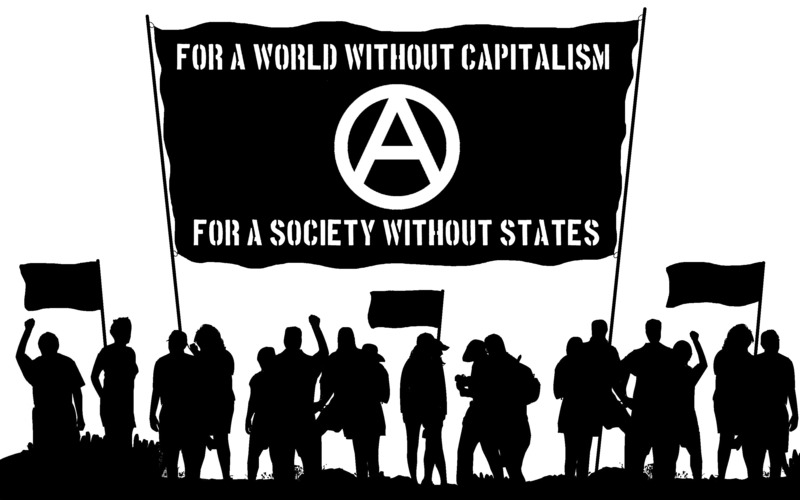 There are many approaches to anarchism, but for me the central issue is the vision of an anti-authoritarian, stateless, classless, oppression-less, society. It is the vision of a world based on cooperation, participatory democracy, production for use rather than profit, free and equal association in all areas of life, and ecological balance with the natural world. It would involve networks and federations of self-managed workplaces, industries, communities, neighborhoods, and (so long as they are still needed) militia units (the armed people). These would be managed by direct, face-to-face, democracy—the self-organization of the people. To achieve this, people would organize under the principle of as much democratic decentralization as is practically possible and only as much centralization as is minimally necessary. This does not mean the end of all social coordination or social defense, but the end of the state. The state is a bureaucratic-military-capitalist socially-alienated machine which is standing above the rest of society. There would be no more masses of professional police, military, politicians, judges, lobbyists, spies, prison guards, and bureaucrats, nor any of the capitalist businesses and semi-monopolies which support and are supported by the state. These are the principles and values of my vision of anarchism. 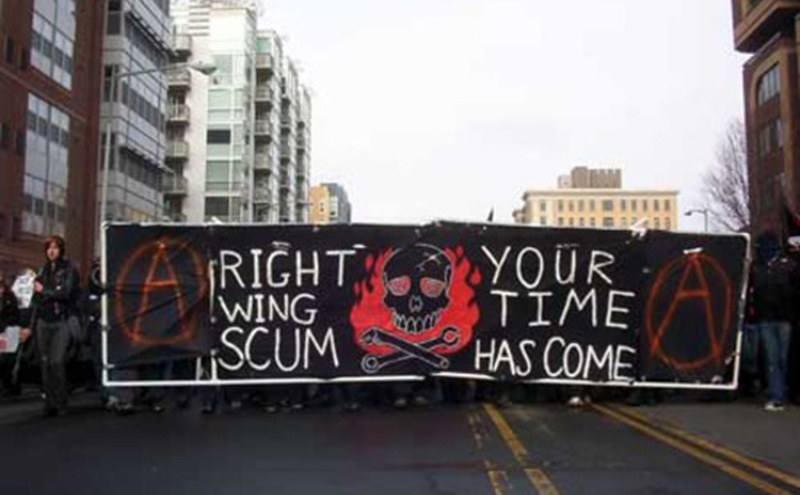 They are consistent with the broad mainstream of the anarchist movement. They are also consistent with the visions once held by millions of a past Edenic Golden Age, or of a future Messianic End Times when all oppression and sorrow will be gone and people will be free and equal. These myths fit the prehistorical truth that humans lived for tens of thousands of years in small, sell-governing, hunter-gatherer groups and agricultural villages, mostly cooperative and equal, without states, or classes, or markets. In a real sense the anarchist vision is of a spiral return to such a society, at a higher level of production—with guarantees of plenty for all and of sufficient leisure, in balance with the ecology. As a vision, this is different from that of liberal capitalist democracy. Liberals and social democrats just want to expand the “good” parts of capitalist democracy while decreasing the “bad” parts. Gradually, a better world will supposedly come into existence. The liberals do not recognize that capitalism has its own limits. In particular, while most of today’s capitalist states claim to be “democratic,” the rulers make no such claim for their economy. The rationalization for the economic system is that it has a “free market.” Any attempt to “extend democracy” to the capitalist economy would mean taking away the wealth and power of those who own the corporations and business enterprises, large and small. It would mean giving the wealth and power to those who work for those capitalists and work in those enterprises. It would give wealth and power to those who buy the companies’ goods, consume their products, and pay taxes that subsidize their profits. To the corporate rich—the whole ruling class—this would seem like a terrible violation of all that was right and proper, the end of civilization, and a totalitarian attack on (their) freedom. The capitalists and their agents and supporters would resist any such change—no matter how peaceful, gradual, and popular—tooth and claw, to the last drop of blood (theirs and the people’s). Their democratic (bourgeois-democratic, that is) state would turn out to be not so democratic after all, as they would use it to crush popular resistance (or they would replace it with a more authoritarian state to do the job). Reforms and improvements for the people have been won and may yet still be won (and should be fought for)—especially in periods of relative prosperity and stability. But when things get bad and the economy goes downhill, the boss class will pull back its benefits, shut down its cooperation with the popular classes, and resist giving any more reforms. This is happening right now. Then the chances for expanding the democratic-liberal aspects of modern capitalism into a better society become virtually nil—without a revolution. 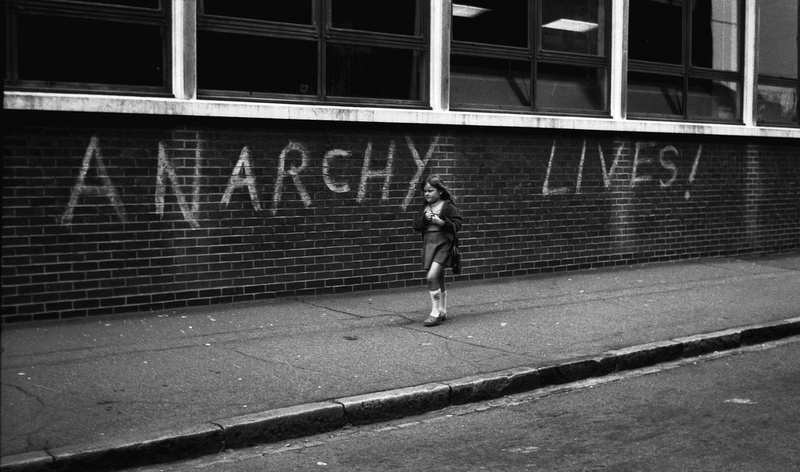 The anarchist vision both overlaps with and contradicts the Marxist tradition. In the mid-1800s, both anarchism and Marxism developed out of movements for democracy, socialism, and workers’ rights. Marxism, like anarchism, had a vision of a cooperative, democratic, society without classes or a state, ecologically balanced—won through the self-emancipation of the modern working class and its allies. Marx and Engels wrote very little about what communism might be like. Their comments are scattered throughout their works. But of what little they wrote, their goal was very close to that of anarchism. Following in the footsteps of the early “utopian socialists” (Owen, Fourier, Cabet, etc. ), both the original Marxists and the anarchists foresaw the end of the division of labor as developed under capitalism. In particular they rejected the division between order-givers and order-takers, between mental labor and manual labor. They saw the reorganization of technology and production in such a way as to expand the all-around potentialities of humans. They expected the end of the division between cities and countryside, between industry and agriculture. There would be a new ecological balance. Having a vision of a libertarian, humanistic, communist society is not the same as having a blueprint of how such a society might work. The early “utopians” wrote detailed accounts of their visions. Marx predicted that a post-capitalist society would go through specific stages. It would first pay workers with labor-notes and later provide full communism (“From each according to their ability to each according to their needs.”) Anarchists, such as Kropotkin, were more likely to use detailed accounts not as blueprints but as heuristic examples of how their principles might be put into practice; for example, going directly to full communism. After Kropotkin, Errico Malatesta argued for an experimental and pluralistic approach to anarchism. He expected different communities, regions, nations, etc., to try out different ways of organizing non-capitalist, radically-democratic, societies, so long as there was no further exploitation. Between Marx and the anarchists there were some important differences. Marx saw the state of capitalism as being replaced, not by a free federation, but by a new state of the working class and its allies. This workers’ state would be transitional, evolving into a non-coercive but still highly centralized “public authority.” And, while he was for a very democratic form of representative democracy, Marx and Engels did not at all see the need for decentralized, face-to-face, communal democracies at the root of a new society. The historical struggle for a better society is not something which happens to people—through historical processes external to them. It is something which people do—as they react to historical circumstances. Class conflict is not a mechanical clash of forces, but a conflict of wills. Socialism is not an inevitability; it is a possibility, which will happen only if enough people chose to make it happen. Marxism went from a vision very close to anarchism to become a rationalization for totalitarian, mass-murdering, state capitalism—until the “Communist” states collapsed back into traditional capitalism. I have just touched on some of its essential weaknesses which contributed to this result (while interacting with objective pressures): its centralism, its “transitional” state, and its non-moral determinism. I reject the moralistic method of starting from a set of values (which a good society should have) to work out a plan for what a good society should be. This was the classical method of the “utopians,” as well as the authors of “Parecon” (participatory economics) today. I also reject the mechanical conception of capitalism grinding out a new society, with a visionary consciousness playing little or no role. Such a view was dominant in Marxism (and, to an extent, in the work of the great anarchist Kropotkin). The split between these two views is based on a positivist split between values and facts. I do not accept this dichotomy. The struggle for a libertarian socialism, for anarchism, is both moral and based on social forces. The vision of a free, democratic, and cooperative society is, then, rooted in the ancient visions of humanity. It is the culmination of the values raised by the greatest teachers, philosophers, and religious leaders. It extends the democratic rights proposed in the great bourgeois-democratic revolutions (the U.S. revolution, the French revolution, etc.) and expressed in the early programs of “utopian” socialism. Now these goals are able to be realized. In past revolutions, the people overthrew their old masters, but then most people had to go back to work if they were not all to starve. Only a few could be free to pursue science and mathematics, social coordination, managing waterworks, etc. Unlike pre-historical hunter-gatherer societies, there was just enough to support this non-producing elite (and its enforcers)—but there was never enough to provide plenty for all. Now humans have the technology and productivity so that hard but necessary labor can be reduced to a minimum and shared by everyone. It is possible for most work to become an integration between creative, pleasurable, activities and useful labor, as crafts have sometimes been. Socialist communities can decide where to use automation, where to use small power machines, and where to work by hand. Contrary to its present development by centralized corporations and military states, industrial technology can be reorganized to support self-governing communities and industries. 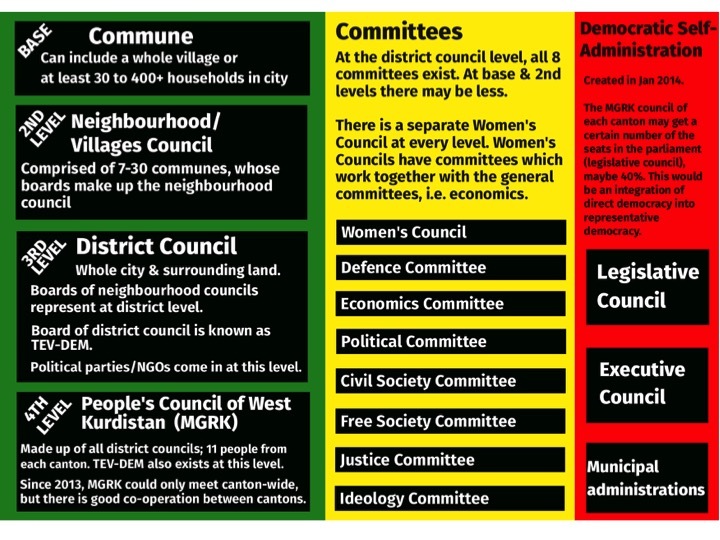 With modern means of communication, decentralized groupings could be coordinated from below. There can be enough leisure for everyone to go to meetings to make collective decisions, without taking up all their free time. People will be able to chose their life styles and activities; they will be able to decide themselves how to express their genders and sexualities. However, because socialist revolution has been so delayed, this powerful technology also poses terrible threats. It is under a social system which developed in scarcity, which divided social wealth among competing capitalist firms, and divided the world among war-waging national states. It exists in a capitalist system which is driven to expand, to grow quantitatively, to accumulate ever more capital regardless of social or ecological costs. The dangerous misuse of modern technology is clearest in the case of nuclear bombs. So far, the capitalist states have avoided nuclear wars. The rulers have feared the results, with good reason. Even a “small” nuclear war (or even a one-sided attack) not only creates local effects through huge blasts, but would throw into the atmosphere radioactive dust and debris, which would effect the whole world. It could cause a “nuclear winter,” blocking out sunlight for years over the whole earth, possibly destroying civilization or even all humanity (and other species). This has not yet happened, even during the Cold War. But non-nuclear wars are continuing across the world, while atomic bombs still exist, they are spread more widely, and they are being updated. The world capitalist class cannot bring itself to get rid of them. It would only take one nuclear exchange, once, to possibly wipe us out. These states and this ruling class need to be disarmed by the working people of the world. At the same time, the capitalist misuse of technology is causing ecological catastrophes. These include the loss of species, the pollution of the land, air, water, and food, and worst of all, global warming. In the here-and-now this causes extreme weather, of storms, floods, droughts, and fires. It is tending towards heat levels which humans and other organisms have never experienced as a steady condition. Whether our civilization can survive is an open question. The problem is that capitalism needs to grow and accumulate, or it collapses. But the ecological world has the exact opposite need. It requires a steady, balanced, system not geared to growth—or at least not quantitative growth of expanded production; qualitative improvements and increased complexity are another matter. This is a deep contradiction. Our industrial civilization is built on the increasing use of fossil fuels—which are limited and nonrenewable, polluting, and cause global heating. Neither the oil companies nor the capitalist class as a whole will willingly end this grow-or-die system. After World War II, the theorists of capitalism claimed that they had solved capitalism’s contradictions. There was to be eternal prosperity (at least in the industrialized—imperial—nations), with tamed business (boom-and-bust) cycles. They would do this through moderate government intervention in the economy (financial stimuli, tax and money manipulations). In fact the post-war prosperity lasted for almost thirty years. Yet the deep crisis of capitalism during the Great Depression was only temporarily overcome. That required massive defeats of the world working class, the rise of Nazism and fascism, the rise of Stalinism, and the Second World War. This was followed by the reorganization of world imperialism (so that the U.S.A. became the main power), expanded military spending (on nuclear arms), the growth of world-spanning semi-monopolies, and the use of “cheap” oil and other natural resources (without paying for their eventual replacement). These forces provided for a new prosperity which lasted until the early 70s, when they ran out of steam. Profits come from surplus value, which is nothing but the unpaid labor of the workers. (So says Marx, and I agree.) The very expansion of capitalist production means that there are ever more machines and raw materials being used, so that the labor force becomes a smaller proportion of what the capitalists pay for production (that is, while the number of workers may even expand, they are relatively fewer as compared to the even greater expansion of the non-human costs of production). This causes a relative drop in the amount of labor which may be used to make the produced commodities (and which determines their exchange value). Therefore there is a relatively smaller amount of unpaid (surplus) labor screwed out of the workers. The rate of profit declines for the overall set of capitalists. There are a range of counteracting forces which limit this fall in the rate of profit, described by Marx. But there continues to be a long-term tendency toward the fall of the profit rate. This basic tendency has reached its long-term expression since about 1900, the beginning of what has been called “the epoch of capitalist decline.” Since about 1970, it has reasserted itself against the apparent post-war prosperity. A major symptom (and, in turn, a contributing cause) has been the expansion of giant corporations: monopolies, semi-monopolies, and oligopolies. Another symptom is the lack of funds to deal with the global warming crisis. Overall, there has been stagnation, under- and un-employment, pools of poverty even in rich countries, expanded inequality, uneven development of the poor nations, increased wars and international conflicts, the growth of financialization (investment in money and paper, rather than in real production), and attacks by the capitalists on the unions and on the working class’ standard of living. The evidence is that the overall economy will continue to decline, with moderate ups and downs, with further, and probably worse, crashes in the future—perhaps a depression worse than in the ‘thirties. These predictions of capitalist decline are not based on some absolute knowledge, rooted in reading Marx’s Capital, or other sources. It is just the best evaluation of probable reality which I and others have been able to make. Along with these looming catastrophes—nuclear war, global warming, economic crashes—are other evils of this system. Capitalism supports—and is supported by—a network of oppressions, including racism, sexism, heterosexism, national oppression, religious bigotry, and so on and on. It continues to be an ugly civilization, crushing the spirit and distorting human potentialities, causing suffering and sorrow in all sorts of ways. This does not make socialism (anarchism, libertarian communism) inevitable. On the contrary, it means that capitalism has a dynamic which leads to greater and worse crises and catastrophes. As an economic system it is deeply flawed and irrational. It is highly unlikely (I will not say “impossible”) that it can pull out of its current extended crash-landing and return to a period of stability and relative prosperity. The last time it did this, from the late 1940s to 1970—1975, it was at the cost of a Great Depression, a World War, post-war spending on nuclear arms, and the vast use of fossil fuels. To revive itself, even for a time, would require something similar. It seems unlikely that the system could survive either another world war or a deepened misappropriation of the natural world. But the people of the world—the working class and its allies among the oppressed—could choose to replace capitalism with libertarian socialism. That is, to make a revolution. While, to repeat, there are forces leading in that direction, this is ultimately a moral choice, made by mass movements of millions of oppressed and exploited humans. The evils of capitalism and its states and oppressive institutions can be rejected and the long-held visions of a new and better world can be created. This does not depend on mechanical historical processes but on moral choice and commitment. ​As they have driven ISIS back in northern Syria / Rojava the Kurdish YPG and their allies in the SDF have won increasing visibility in western media. While such reports often mention the key role in this fight played by women in the YPJ, there is otherwise little examination of the revolution happening behind the front lines in Rojava. That revolution is why they stood and fought ISIS rather than fleeing. This can be true of a lot of alternative media coverage. In part this is due to the limited amount of information on what this revolution involves. but it’s also in part because photographs of women with guns are judged to be more striking than women workers in a co-operative bakery or a community assembly. Join the demonstration at Friday December 30th there will be a demonstration at 11:30am at Venizelou statue (Aristotelous square, Egnatia) in Thessaloniki, Greece. We are all refugees. We are all Basque solidarians. We are all traffickers of solidarity. The signatories of this letter express our unbridled solidarity and demand the immediate release of the two Basque activists and the 2 refugees who questioned in practice the racist border regime of the EU, who were arrested at the port of Igoumenits, and who are today threatened with heavy charges for “illegal trafficking of migrants” and with lengthy detention and deportation, respectively. We would like to declare that this act of civil disobedience by Mikel and Bego, to transport refugees from Greece to Basque Country is an act that must not only not be persecuted, but which sets the example for humanity, solidarity and justice, in a Europe which more and more resembles the darkest times in its history, a Europe which builds fences and which marshals armed forces against refugees fleeing war, oppression, and poverty. The arrestees Mikel Zuloaga, Begoña Huarte, Reza Ali και Ahmet Awais have earned our full respect and support. We will not accept the criminalization of solidarity, on the pretense of a crackdown on “trafficking”, which is met with heavy prison sentences. With them, we will fight against the barbarism of Fortress Europe, against the segregation of people by nationality, religion, gender, for freedom of movement and for the right to remain.